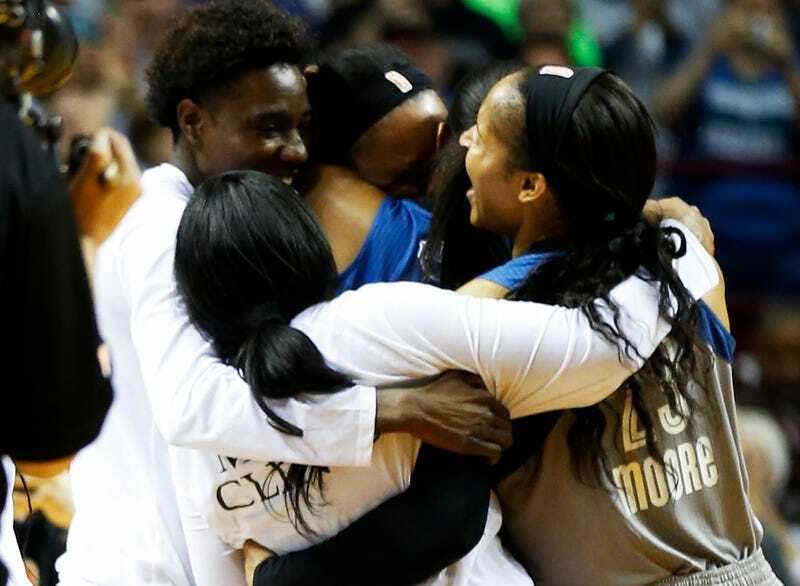 On Wednesday the Minnesota Lynx held off a scrappy late-fourth-quarter effort by the Los Angeles Sparks to clinch their fourth title in the last seven seasons, thus solidifying their place as the greatest WNBA franchise in the history of the WNBA. In Game 5, the Lynx controlled what turned out to be a thriller right down to the wire, pulling off an 85-76 victory over the Sparks. It was everything you want from a championship game between the league’s two best teams. Sylvia Fowles played like a beast, scoring 17 points and grabbing a WNBA Finals-record 20 rebounds before walking off the court as the championship MVP. Maya Moore had 18 points and 10 rebounds and hit a pull-away runner in the lane to stop the Sparks’ attempt at a comeback with just 26 seconds to play. Lindsay Whalen added 17 points and eight assists, and Seimone Augustus had 14 points, six assists and six boards to tie the Lynx with the Houston Comets for the most titles in league history, the Associated Press reports. Yes, I remember the Comets, which featured WNBA greats Cynthia Cooper, Sheryl Swoopes and Tina Thompson, and I’m still calling this Lynx team the best franchise in WNBA history. And here’s why: They’re not finished, and they know how hard it is to win a championship, and they’re up for the challenge. Translation: The women on the Lynx are fully aware that they were chasing history; now they know that they can surpass arguably the greatest team in the WNBA before the end of next season. Moore knows that this team is on the cusp of greatness, but she’s also humble enough to respect those who came before her. Read more at the Philadelphia Tribune.